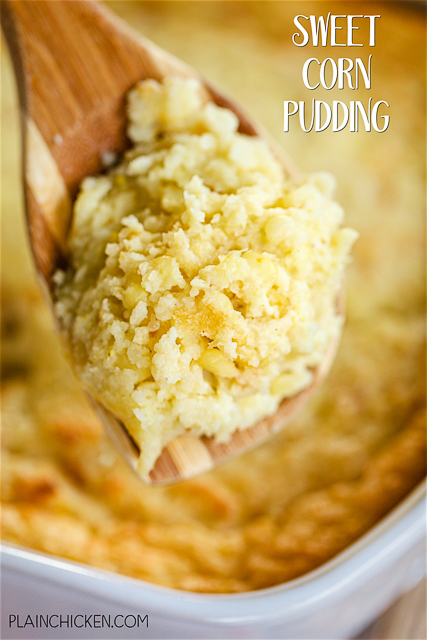 Sweet Corn Pudding - a family favorite! Fresh bread crumbs, cornmeal mix, sugar, eggs, milk, half-and-half, butter and frozen cream-style corn. This tastes AMAZING!! Great anytime of year. We love it with grilled chicken, pork chops, steak and BBQ. It is the perfect side dish for the holidays too! Today I am sharing another side dish for your upcoming holiday meal. 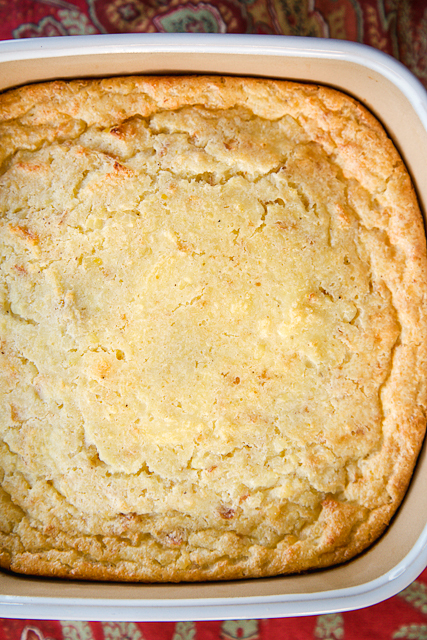 This Sweet Corn Pudding is a long-time favorite. I've been making this recipe for years and couldn't believe that I haven't shared it on the blog yet!! It is super easy to make and tastes great! We make it year round. It goes great with grilled chicken, steaks and BBQ. This recipe uses fresh breadcrumbs, not canned breadcrumbs. To make the fresh breadcrumbs, I take some day old french bread and pulse it in the food processor until it is nice and crumbly. This recipe won't be the same with canned breadcrumbs. Please don't used canned!! If you don't have french bread, any bread will work fine for the fresh breadcrumbs. I've used white bread and leftover hamburger buns. You can freeze any leftover breadcrumbs for the next time you make this casserole. Preheat oven to 325ºF. Lightly spray a 9x9-inch pan with cooking spray. Set aside. Combine breadcrumbs, cornmeal mix and sugar. Set aside. In a large bowl, whisk together eggs, milk, half-and-half and melted butter. Whisk in breadcrumb mixture. Stir in corn. Pour into prepared pan. Bake for 60 to 65 minutes or until golden brown and set. Let stand for 10 minutes before serving. I don't have a food processor. Is there another way to make fresh breadcrumbs? where can you get frozen creamed corn? can you use canned? There are a couple of versions of creamed corn in the freezer section. They are a roll.